I was unable to prevent myself from trying to figure out the Koenigsberg bridge problem despite knowing beforehand it was mathematically impossible to solve. Thanks to your wonderful post I have also just been reading about the very interesting Paul Erdős. Eccentric indeed! I think no more than two of the islands may have an odd number of bridges for the path to be possible. I’m sure there are other constraints too. 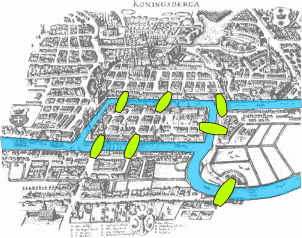 I think the Koenigsberg bridge problem is something of a combinatorics thing, which is a crazy type of math.